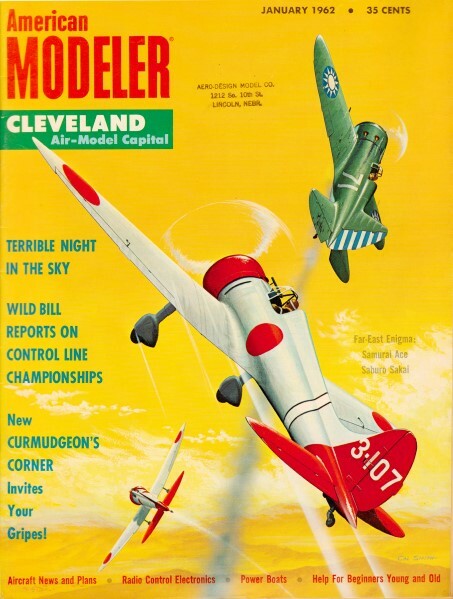 Well-known modeling editor Bill Winters waxes wonderingly about whether the "theoretician" modelers who use "wind tunnels, slide rules, [and] adding machines" might really be gaining an edge over the "rule-of-thumbers" who pioneered the basic precepts of various model aircraft design and operation through trial-and-error processes. By removing environmental variables like wind, thermals, and terrain, he considers how recent gains in indoor events have rewarded renowned "thinker" type modelers with great advanced in record performances. Bill Winter takes a look at engine break-in systems, provides much data on what happens inside there. Should you break in a new engine? Ask your modeling buddies and you'll get answers ranging from yes by all means, through all shades of maybe-sometimes to it's a waste of fuel. If these answers baffle you, just don't ask the guys who say yes, how they go about loosening up a scrawnchy mill. Merlin - would have been right at home with his incantations, fiery circles and stuff. Can't remember whether or not the Brown Junior required breaking in. The prehistoric Junior apparently got awfully hot - but it kept running. Fins became purple. We do know that from the late thirties until after the war, when glow plugs and "shoe polish" fuels came on the scene, engine breaking-in was de rigor, whatever that is. It was nothing to clamp your new Bantam to a bench and let it howl from dawn to dusk in the back yard. Neighbors - some of them anyway - took kindly to ambitious young men who strode the path of Lindbergh. (Today they call the gendarmes or the guys in white coats.) Engine producers like Benny Shereshaw made their engines so tight you had to run them for hours. Recall OK's post-war Mohawk .29, which we turned over with a hand drill - the Merlin (not the sorcerer this time) was another. We remember Keith Storey telling us that the first team race put on in California was won by a Mohawk. Further, our number-one boy fledgling flew the family Mohawk for two years in Ukie and it hadn't begun to wear. Now the best Torps we ever had included the first two-speed .19 - personally we loved the older Torpedo of the late forties before everyone went rpm crazy - which Ted Martin ran 10 hours in engine tests with all kinds of props, big and little, and at some shattering rpm figures. That poor engine afterwards wore out three Live Wires and was hotter than ever when some fool drove a station wagon over the nose end of the last LW. The other hotter-than-hot Torp was a .23 that one of the sprouts pilfered from our hope chest, ran wide open new in Ukie stunt, leaned out, piled into the mud, and so on. For 18 subsequent months that .23 struggled valiantly with our seven-pound rudder job. "Snicker": J.M. Trego's FAI Power. 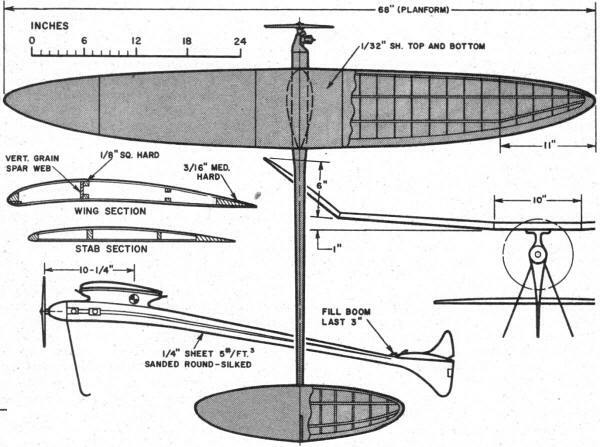 Wingspan, 68" (platform); 40-60 ellipse; Wing Root chord, 9"; Aspect ratio, 9"; Wing area, 445 sq. in. ; Stab root chord, 6 1/2"; Stab area, 120 sq. in. ; Wing incidence, four degrees; Stab incidence, 3 1/2 degrees; Center of Gravity, 70%; Wing airfoil, Goldberg G-610; Stab airfoil, 6.8% at 30% (flat bottom). Of course, we broke in many engines for hours on end. In the air they over-heated and died. One of them had so much compression it wind-milled in fast glides. The truth of the matter is that some modern engines require no breaking in (and come to think of it, whoever heard of breaking in an Arden; we turned 12-inch and cut-down 14-inch props on a .19 on 90-degree days) and others will be ruined if not run-in. Have had Webra Diesels, for example, that would freeze if leaned out within four hours - but when they came-in they'd outlive a turtle. Two buddies have Super Tiger R/C's on the block for six hours and the engines are not yet ready to handle multi chores. Our Frog .09 diesels were still picking up rpm after 11 hours of flying! There was one glow .09 of ours that wore out the bearings before it broke in enough to fly! And so it goes. "Mozagotl": Werner Petri's 1960 FAI Power. Wingspan 84 1/2"; Overall length, 53"; Wing area, 461 sq. in. ; Aspect ratio, 15.5; Stab area, 102 sq. in. ; Wing incidence, zero; Down thrust, minus 3 degrees; Side thrust, 1 degree; Stab incidence (power), minus 2 degrees; Stab incidence (glide), minus 4 degrees; Center of Gravity, 77%; Power, reworked Super Tiger G-20 (1959) with intake extension (kadency effect). 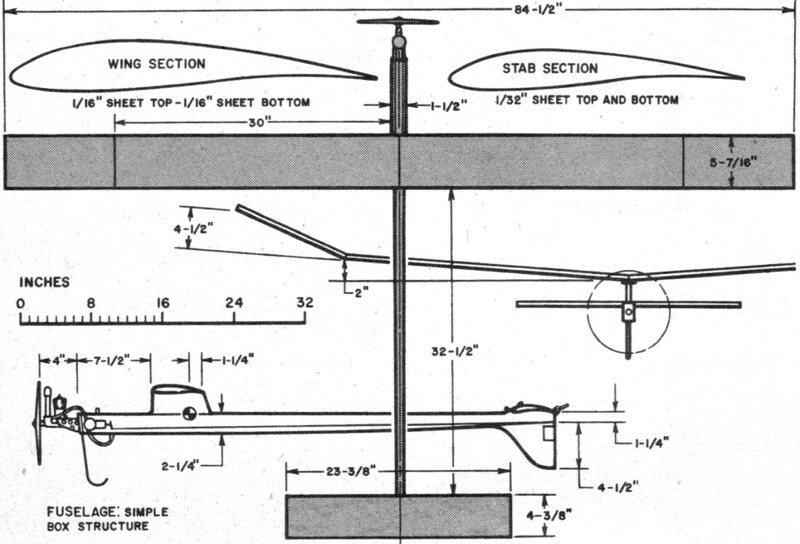 Auto-rudder and auto-stab trim operated by single mechanical timer, auto-stab operated by bell-crank on T.E. Machined dural engine mount with four synthetic rubber grommets for vibration isolation. Having read Hi's very useful data umpty-ump times we have learned something new, proving that you can teach an old dawg new tricks. To boil it down, Hi describes a kind of molecular stampede in the metal as it is machined, worked, and treated during the manufacturing of an engine. (Incidentally, some guy on the side lines tells us that it is always "engine", and never "motor", because motors are electric). Manufacturing processes, it appears, introduce stresses in the materials and the mischievous molecules remain partially unstable after that, no matter what. The crux of the matter is that the number of cycles of heating and cooling that an engine must pass through to attain molecular stability depends entirely on the molecular state of the metals at the time of engine purchase. Having had two new .15's freeze in the air, tossing expensive nylon props, and washers, into the weeds - new sleeves and pistons coming up! - we'd say this molecular state sometimes borders on anarchy. Anyway, the word is that it's the first four or five minutes of running time (each time) that counts, and not a three- or four-hour break-in run that only frees the engine slightly. According to the Johnson Doctrine, many short runs, never leaning out, allowing the engine to heat up and cool off completely, bring law and order to the delinquent molecules. The bigger the engine, the more the naughty molecules. And that is why Half-A engines take little or no break-in time. Shucks, we always thought the Half-A engine makers were more ingenious! How about break-in fuel? Use a mild fuel (less than 12 per cent nitro) for the first hour or two - on .15's and up, decrees Mr. Johnson. For small engines, use the fuel marked "For Half-A" on the can. Adjust the needle to medium rich (medium rpm four-cycle), run off a five to seven-ounce tank. Repeat as many times as necessary for at least 30 minutes running time. To this we add, don't overload the engine with a big prop during break-in. Is "Theory" Vindicated? Probably you, too, have noticed the growing respect for "long hair" designers. Like breaking in engines, the merits of theory as opposed to the rule-of-thumb school of design has always been good for a rainy day argument. For many years the American approach leaned toward rule-of-thumb. A lot can be said for it. In the beginning, pioneers endlessly ground out models, gradually changing this and that until they knew all the basic answers on proportions, areas, dihedral, and so on. Some became authorities - justly we think - by evolving formulas to express what they already knew, so that others could apply the hard-won knowledge. In the middle years, when modeling attained truly popular acceptance, anybody who built a few jobs that flew fairly well could consider himself a theoretician. To the rest of us some of these talkative chaps were a pain in the neck. By reaction we became a bunch of rule-of-thumbers. Oh, there were guys who thought, witness Goldberg and the pylon gassie, but this was still a common-sense, though impressively reasoned approach. That is, it didn't require wind tunnels, slide rules, or adding machines. Perhaps we began to have nagging doubts about our instinctive disapproval of "theory" when, in Europe men like Czepa, Hacklinger, Benedek, Van Hattum, Lindner, Samaan, largely through Nordics, displayed results that at least proved a man could be deeply theoretical and a top flier at the same time. So effective was their approach that until Gerry Ritz came along the U.S. had practically conceded it could never match the Continentals in some areas. A rule-of-thumber himself, ole Zeke, has got to concede the theory boys - the authentic ones, not just every guy who decides to go into the theory business for himself - must really have an edge. This superiority is hard to evaluate because natural things - such as thermals and time limits - don't exactly encourage, or maybe even justify, all-out theory. But what has set us to thinking, is this achievement of Hacklinger's, a 44-minute flight in indoors. Don't spoil it by telling us the flying site was super, but it seems to us that when a deep thinker like Hacklinger, who long has held wide respect, on relatively short notice (indoor is practically new in Europe) comes up with a performance like this, he has demonstrated that "model engineering" is equated with efficiency. Though all designs that can max interminably seem the same, we shall suspect from here on in, that one must always be better than all the others. It is nice to have the best. Back to the drawing board!